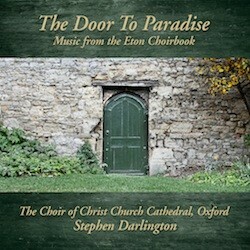 The Door to Paradise celebrates Stephen Darlington’s 30+-year legacy as Director of the distinguished Choir of Christ Church Cathedral, Oxford. 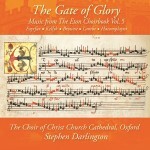 This unprecedented contribution to the choral discography is the most comprehensive collection to date of music from the Eton Choirbook. The Door to Paradise brings together all five volumes of the Choir’s survey in a newly-packaged, beautifully presented deluxe box set with a newly-penned overview of the project by Darlington. 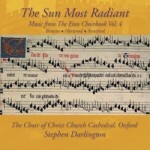 This extraordinary collection of English sacred music from the early Renaissance reveals a striking diversity and range of stylistic structures, harmony, sonority, ornamentation and improvisation, and brings to light two world premiere recordings – Walter Lambe’s Gaude flore virginali and John Browne’s second setting of the Salve regina. The collection’s title derives from a dual meaning: the “door to paradise” is the English translation of a line from Browne’s O regina mundi clara, while the cover image features the “Alice Door” between the Deanery and Cathedral Gardens of Christ Church, Oxford, featured in Lewis Carroll’s Alice’s Adventures in Wonderland.